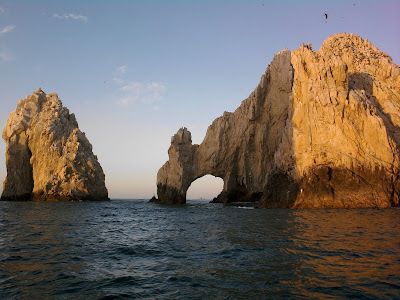 In spite of their best efforts, U. S. Airways was able to deliver Marianne, Tillie, and myself safely to and from Cabo San Lucas this past week. But, in spite of our traveling debacles, we had an awesome trip. The weather was great, the food was good, and we caught some awesome fish. I don't have all of my pictures downloaded yet, so I'll will write up a full report in couple of days. First, is my nephew Bailey. 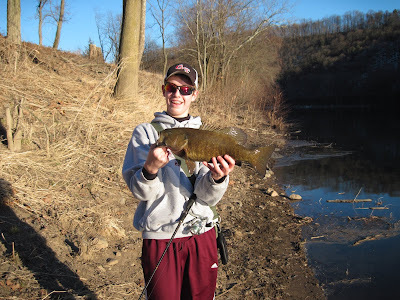 Last week Bailey caught his new personal best smallmouth. He was fishing in the river with my Dad, and was breaking in a nice new spinning rod that he had just purchased. Needless to say, he did it the right way. The monster bass was 20 inches long, and was caught on a jig and soft plastic. Way to go, Bailey! Last, I wanted to bring to your attention the recent U.S. Fish and Wildlife Service (USFWS) announcement concerning the new draft of the Migratory Fish Management and Restoration Plan for the Susquehanna River Basin. Here's is a link to the PAF&BC announcement concerning the new plan. Here is a link to the actual draft of the Susquehanna River Migratory Fish Management and Restortaion Plan. If you are like me, and would love to see fishable numbers of american shad and other anadromous species (like striped bass) return to the Susquehanna River, check it out. It's open for public review until the end of March. The draft is long, but very informative...with some very educational material covered within the draft.